There was a great Facebook conversation going on about parks in Omaha recently. Everyone has an opinion about parks and what makes them the best: Sand vs. non-sand, themes, variety, location, crowd levels. So I’ll chime in below with my favorite parks. This “8 Great” list is the first in the series I’ll be doing on the blog with reader input on what to include. Check back for future ones on breweries, restaurant patios, and more! 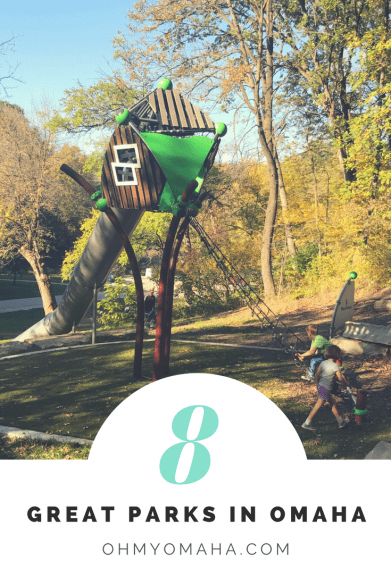 If you’re bored with your neighborhood park, here are some of my family’s favorite parks in Omaha. If you’re looking for parks with hiking trails, here’s a list of seven great trails for families near Omaha. Why: This park’s playground is outstanding–and a no-sand playground to boot–and it’s next to a fun (and popular) splash pad. The small lake is nice for a stroll and fishing is allowed. Summer time at Benson @omahaparks! Where: 802 S. 60th St.
Why: This park’s playground was recently updated, with some nice climbing areas added to it. Elmwood is one of my favorite parks because of the open space and the trails surrounding it. Take a short walk through the woods to imagine a little escape from the city. And if you’re so inclined, there is a fitness area right next to the playground where you can sneak in some weight-bearing exercises in while the kids play (I’m never so inclined). 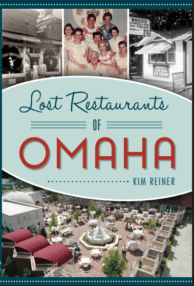 Why: Omaha’s oldest park often gets overlooked by shinier new parks. However, its playground was updated in 2017, and it’s a great one. This park also has the perk of lots of gorgeous trees, a nice little lake, a pool, and a dog park. Why: This is our favorite city park for hike! It also has the best special events (so check the city’s calendar from time to time). The playground consists of rather large metal slides. They look cool, and my kids love them, but if you’re a nervous parent, I’d stay clear until your kids are steady climbers. Part of me doesn’t want to admit how nervous I get watching the kids climb up these slides the first time. They’re really no different than a typical slide, but still. Why: This lakeside park has a pretty sizeable playground, a boat ramp, and fishing is allowed. And the covered picnic area is a nice bonus. 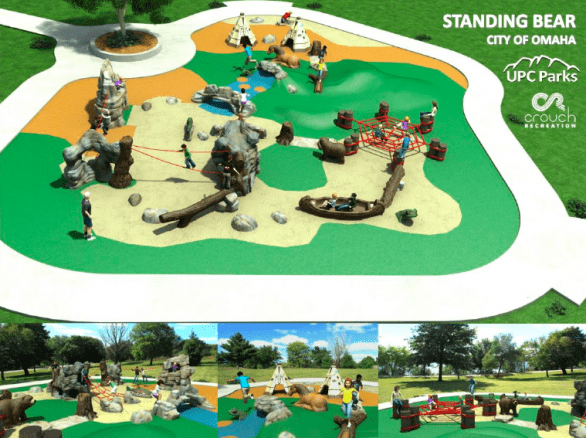 Artist rendering of the new Standing Bear Lake playground. Where: 6404 N. 132nd St.
Why: I like Standing Bear Lake for the lovely trail, but soon, it’s getting a new playground with a Native American them. The good news is: It won’t have sand. Where: 3808 S. 156th St.
Why: This is my absolute favorite park to run the trails, and they’re good for bike rides, too. The trail to the west of 168th Street is so wooded, you’ll feel removed from the city. The main playground near the boat ramp is huge and a hit with kids. Why: This large, wooden park located in Lake Manawa State Park in Council Bluffs, Iowa, was originally designed by kids’ submissions of what the perfect playground would look like. It’s currently under construction to be updated, so stay tuned for details on when it’s reopened (or just check this page Dream Playground Reimagined). Lake Manawa State Park also has trails and a small beach. 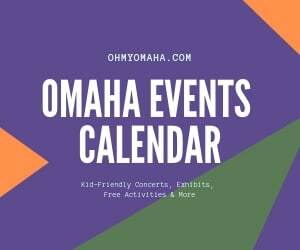 I’d love to know your favorite parks in Omaha! Please leave a comment with your favorites. How fun! We love exploring parks around our area too. Makes me want to make a list myself! Thank you, Cheryl! You should make a local list, too. I bet your readers would appreciate it. These parks look awesome! And I’m loving the idea of the Great 8 series! These parks look amazing. I wish I lived closer to take advantage of some of them! When is the Standing bear due to open? Hi Luisa – I heard it should be finished by the end of June, weather permitting. Great breakdown of the parks! I’m so glad you included pictures! Oh my gosh! Hummel Park looks so fun! I can see why its one of your favorites 😉 Even as an adult, I could spend a whole afternoon there!